For those looking to find accommodation in Jeongseon, the city where the Alpine Centre for Olympics alpine skiing games is located, a very Korean retreat could serve as a cultural experience as well as a base camp for the upcoming Winter Olympics season. Yoon In-sook, 60, built for herself an organic haven in the rural region of Jeongseon, Gangwon Province, where she lives amongst untouched nature. Yoon claims that her way of life has helped tremendously in improving her health and invites all those wishing for a break to come. Her fragrant clay houses are heated with logs in the old-fashioned way, and the floors of the houses offer roaring warmth during the long winter nights. Yoon’s obsession with everything organic started from the cancer that hit her 12 years ago. She combed through the country from Jeju Island for clean nature where she could recuperate until she finally settled down in Jeongseon where she found the air to be the freshest. The clay houses Yoon lives in are built using handpicked natural raw resources. To surround herself in a completely toxin-free environment, Yoon studied how to build a clay house from scratch. She located her own resources, hired hands to build the lodgings according to her designs, and when the men quit after building only two houses because Yoon’s 100-percent-organic construction methods were too difficult for them to handle, she and her family took it into their own hands to build the final house themselves. Yoon did not intend the houses to become payable accommodations in the beginning. The three houses were initially for her parents, herself and visiting friends. She opened her doors to everyone she knew who wanted a break. But after her parents passed away, and her friends from her hometown of Busan made fewer visits, Yoon started to receive guests. 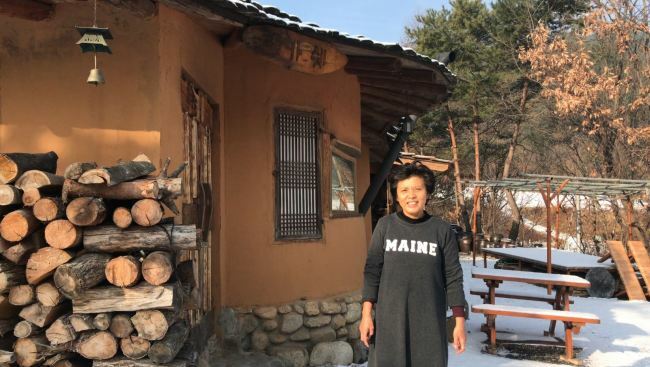 Yoon’s three clay houses are up on Airbnb under the name “makashe,” which is the regional dialect of Gangwon and Gyeongsang Provinces for “everyone, come and rest.” Having guests helps Yoon pass the time in the quiet mountainous county. Because Yoon’s eyes tire easily when looking at computer screens, Yoon’s daughter, who lives in Seoul, is the one who communicates with guests on the Airbnb site. “Once, an aged gentleman brought his even older sister who was well past 90 years old to my house. She had trouble falling asleep, and hadn’t slept for many days. She slept that night in the clay house like a newborn and showed tears the next morning for the sound sleep she got,” Yoon said in an interview with The Korea Herald. Yoon has found that her health conditions have improved since changing her environment. The change happened slowly, without her realizing it. Many factors could play a hand in this, as yet another major part of Yoon’s lifestyle is the organic food she consumes. Yoon grows her own vegetable and ferments her sauces herself in her garden. 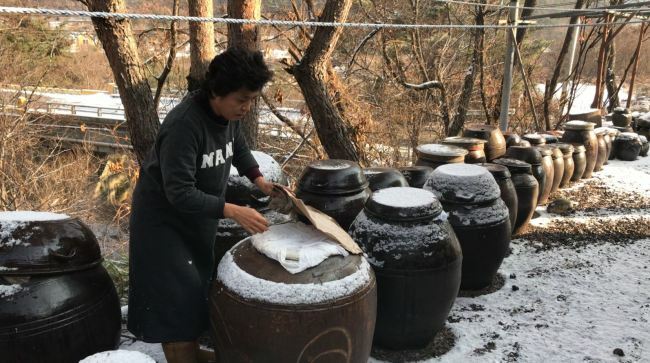 From soy bean paste and chili paste to vinegar, syrup and herbal medicine, there is nothing Yoon eats that she doesn’t make in the earthen crocks in her backyard. For her guests, Yoon can fix typical Korean breakfasts for a minimum fee, but she warns her food can taste bland as she spares the use of spices. “There is a promise I made with myself upon coming here, which is to share,” Yoon said. “When you give away something, you might think that you lose it. But this is not true. What you give always returns doubled, tripled. When I do someone a favor, it’s not that same person who returns what is given. Someone else comes and does me good, and the goodness spreads this way,” Yoon said. For the Olympic Winter Games PyeongChang 2018, a few non-Korean guests have booked Yoon’s Airbnb. Yoon said she is looking forward to meeting them.